to get yourself a sketch? I’ve faced some uncomfortable situations trying to finish a drawing when conditions have been less than ideal. And by that I don’t mean having to draw my Martini glass because drawing anything else would need craning my neck from time to time, and wouldn’t that be an errant imposition? No, I didn’t mean that at all! I’m alluding to conditions slightly more disagreeable, situations where you’d need to muster the will to see through the process, and in my case the likes of trying to find a smidgen of dry space to stand on and crack open my sketchbook inside Tokyo’s Tsukiji Fish Market and having to make do with a slick pavement of fish scales, grime and dark coagulated blood from the monstrous piles of tuna flesh stacked on a handcart behind me. Or squinting my eyes to guard the midday sun in Mumbai’s blistering heat to capture the Gateway of India. Or hanging from a kiddy stool typical of Melbourne’s laneway cafes for half an hour and having my feet stomped upon by countless tourists incessantly just to get that pretty patisserie across the road on paper. I would go on with my exhibition of bravado for the sake of art but I rather not. My bragging rights have been put into perspective after reading viral posts about artists who’ve ventured into war zones, conflict-ridden territories and uninhabitable climes to report, record and interpret what they see of this world through absolutely fetching drawings. Well, let’s just say we’ve all endured different degrees of discomfort in the process of making art en plein air. And just as these instances remain etched in memory soaking in masochistic pleasure juices, so are the times that deprive us of them, the times when everything go right, the environment is ideal. Rare they may be, but definitely not extinct. Once in a long while there’ll be a perfect view spread right in front of you and although it’ll be midday and the afternoon heat will char your skin as if on fire, the branches of a raintree in the corner will be aligned such that the sun will be blocked out and on that very spot of shade will stand a table with a lone chair that by some astonishing stroke of luck will be unoccupied. 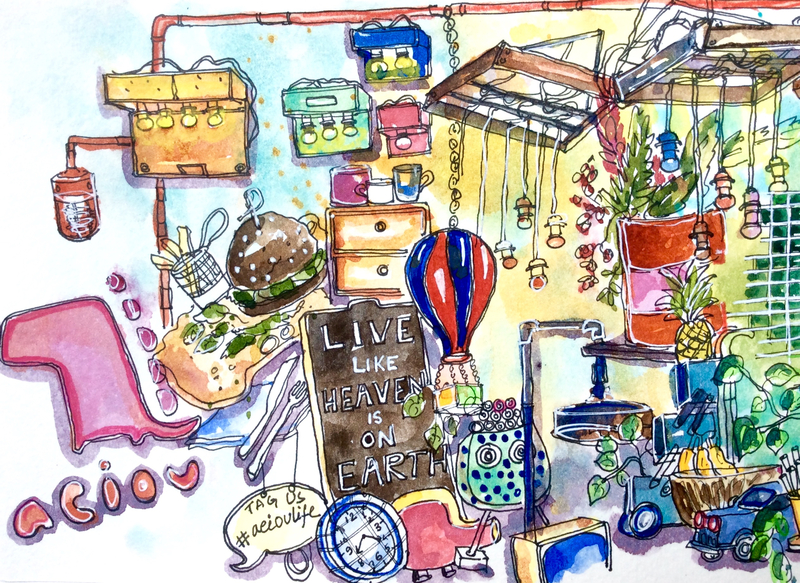 This entry was posted in Daily Vignettes, Shophouses and tagged drawing, Jalan Besar, Shophouses, Singapore, Tyrwhitt Road, urbansketchers, urbansketching on December 3, 2015 by Somali Roy. Sunday evenings are rife with the sweet pain of separation. The sought after ‘weekend’ buoyant and alive in your arms a moment ago grows listless and impatient as the day proceeds. You already feel the tug and in utter despair try finding ways to stretch whatever time you have with one another. In our case, it leads to a frantic internet search for cafes, preferably somewhere we’ve never been to and can spend the evening there, reading, lounging, chatting, eating and drinking, and of course sketching till the staff puts away their aprons and chef hats and the ‘open’ sign on the front door has been flipped. In short, a place where we could save ourselves from moping till bedtime. The success rate of finding such a place maybe abysmal – if the ambience works, the coffee disappoints; if coffee’s good, the chairs are stiff; if the chairs are comfy, the staff maybe unfriendly – but we do get lucky sometimes. Last week’s search yielded the names of few interesting places in the Jalan Besar area, out of which we picked ‘AEIOU’ because it’s been popping on my newsfeed a lot lately. If this cafe was a person, I’d imagine him wearing mismatched socks with self doodled converse shoes paired with black suit, pinstripe shirt and his grandfather’s beret. He’d also have a ponytail, dyed purple and a satchel fashioned out of discarded denims or burlap sacks slapped across his shoulder. He’ll stand out in a crowd but is oh-so-sure of himself. And in the midst of gawking at this interesting bloke and trying to make sense of his persona, if you simply extend your hand, he’ll take it warmly and make you feel comfortable. That is how we felt for the rest of the evening. “Look at our table – it’s made out of a grilled window!”, whispered my husband. The glass in which his drink appeared was a chopped off portion of Grey Goose Vodka bottle. About us were mismatched old fashioned chairs, battered drum working as a flower vase, robots made out of tin cans that used to hold salad oil, hanging lamps made of kettles and toolboxes, pipes and window frames, suspended hot air balloons that doubled as decorative plant holder, jaded 70s furniture with funky paint on them and so much more that even before we ordered, I started sketching this whimsical mess and became extremely unsociable until the ‘root vegetable fries’ arrived. My husband picked out the potatoes for himself and piled the yams and sweet potatoes on my side. This sneaky underhand tactic worked only because I loved the taste of my side of tubers. 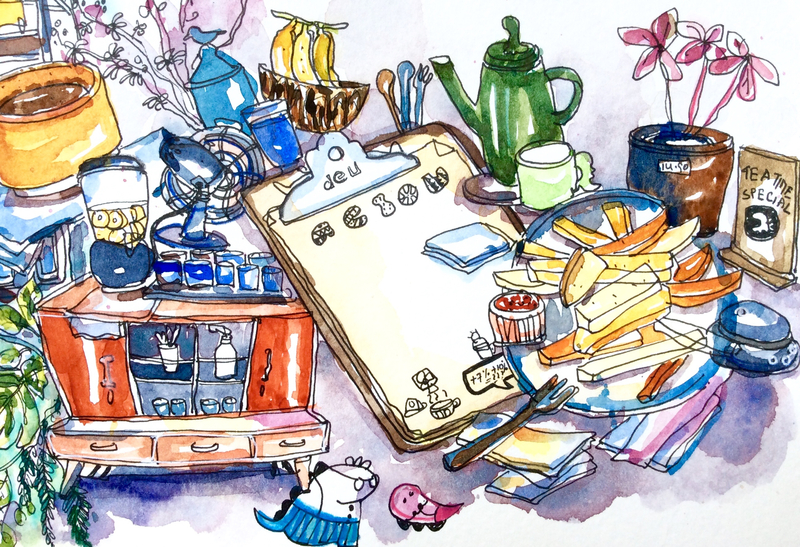 In another two hours I finished sketching over several cups of green tea. Reluctant to leave just yet, we ordered dinner with enough apprehension. If the food was meh I would’ve let it slide because you can’t tick all the boxes plus we were already having a good time. My chicken burger with a light salad atop a dino shaped wooden platter was gourmet standard. So it scored a last minute place in the sketch before the calls of ‘last order’ came and with it all the signs and signals of closure. Monday was inevitable and looming large. We were ready. 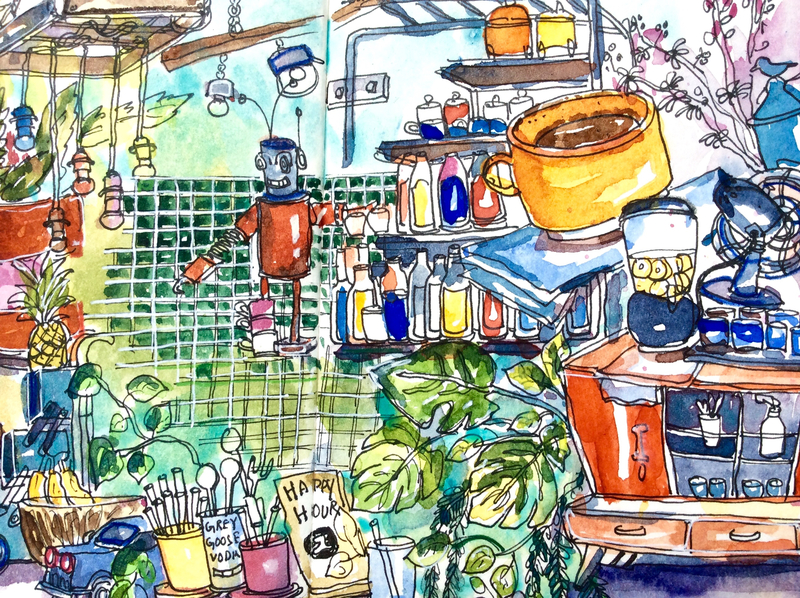 This entry was posted in Daily Vignettes and tagged AEIOU cafe, AEIOUlife, Cafe sketching, drawing, illustration, Jalan Besar, Singapore, urban sketching, Vowels on August 21, 2015 by Somali Roy.